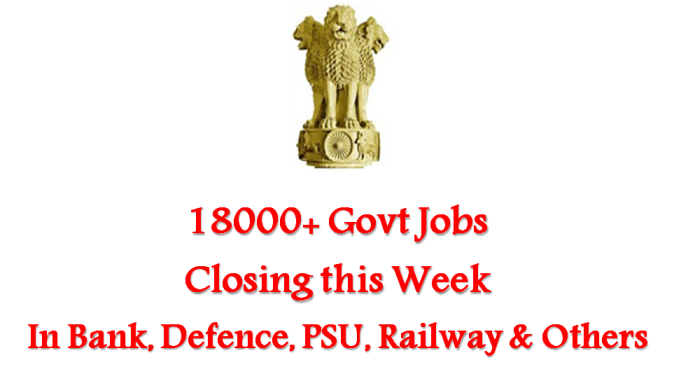 Are you aware that more than 18000 govt jobs are closing this week? Jobs in Indian Railway, Bank, Defence, SSC, different Indian Ministries, PSUs and other govt bodies are closing down their online registration portal. If you are a serious job seeker, do not lose this opportunity and start applying right away, if you haven’t yet. Ordnance Factory recruitment will close its recruitment for 6948 ITI and non ITI posts on 07 February. Similarly driver post recruitment for 2939 vacancies will be conducted by Gujarat State Road Transport Corporation till 11 February. If you are a teaching job aspirant, do check for Gujarat State Education Recruitment Board, Odisha Adarsha Vidyalaya Sangathan and govt of Mizoram. Taking State wise vacancies into consideration, Odisha and Gujarat will shut down the recruitment portal for near about 5000 vacancies in total. Bank jobs are available at State Bank of India (Medical Officer post) and District Cooperative Bank Satara (Clerk post). Other prominent recruitments include NCDC, MCGM, CRIS, EIC India, Ministry of Defence, etc. Candidates with minimum educational qualification, as prescribed by the recruiting body for the respective post can apply. Candidates are suggested to go through the eligibility criteria thoroughly. In many cases, it may happen that for the same post two recruiting bodies may have different eligibility criteria. All the vacancies mentioned seek applications from eligible 10th pass, 10+2 pass, graduates and postgraduates.